Earlier today I received a notice from the Portland Police Bureau about their new patrol cars and the Police technology that will be on display for the general public. It’s a “show-and-tell” exercise for the media. The demonstration includes the latest in Automatic License Plate Reader (ALPR) technology. Yeah, those quiet mass tracking devices that log license plates and perform driver surveillance! 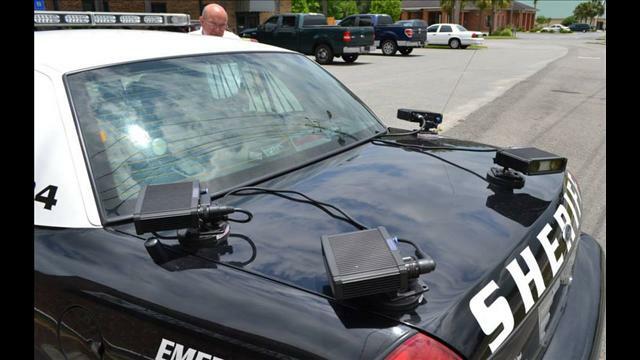 Cruiser-mounted cameras can scan about 700 license plates an hour. We’re starting to get a clear picture of the technology deployed for mass routine location tracking and surveillance. Automatic license plate readers are the most widespread location tracking technology available to law enforcement. Mounted on patrol cars or stationary objects like bridges, they snap photos of every passing car, and motorcycle recording their plate numbers, times, and locations. At first the captured plate data was used just to check against lists of motorcycles or cars law enforcement hoped to locate for various reasons (to act on arrest warrants, find stolen vehicles, etc.). Increasingly, however, all of this data is being fed into massive databases that contain the location information of many millions of innocent Americans stretching back for months or even years. In addition, private companies are also using license plate readers and sharing the information they collect with police with little or no oversight or privacy protections. I’m okay with law enforcement’s use of these systems to take pictures of plates to identify people who are driving stolen cars or are subject to an arrest warrant. The technology makes it possible to check plates against “hot lists” of vehicles that are of interest to law enforcement. This can be done almost instantaneously and if the plates generate a “hit” I can understand the need to store the data for investigative purposes. But, how long should the plate data be retained? Automatic license plate readers have the potential to create permanent records of virtually everywhere any of us has driven. It could radically transform the consequences of leaving home to pursue private life, and opening up many opportunities for abuse. In Portland, Or., the data retention rules are a minimum of 30 days to a maximum of 4-years. More information is HERE. Like many, I don’t like this growing trend where the government is increasingly using new technology to collect information about American citizens, all the time, and is storing it forever — providing a complete record of citizens’ lives for the government to access at will. Should you care? Yes. In New York City, for instance, police officers have reportedly driven unmarked vehicles equipped with license plate readers around local mosques in order to record each attendee. What if entire motorcycle clubs/communities are targeted based on their associational makeup? It’s a core principle that in the United States of America, the government does not invade its citizens’ privacy and store information about their innocent activities just in case they do something wrong.